Puerto Rico, officially Commonwealth of Puerto Rico (Spanish: Estado Libre Asociado de Puerto Rico) is a self-governing unincorporated organized territory of the United States located east of the Dominican Republic in the northeastern Caribbean Sea. During the period of Spanish colonial rule in the nineteenth century, the islanders were confronted with the choices of full assimilation (statehood), autonomy (commonwealth), or independence. This issue was never fully resolved at that time, and has re-appeared again in relationship to the United States in the twenty-first century, as the island's leaders push for resolve. To many of its people, this is not the most serious issue they face, and few desire to break ties with the U.S. The majority of the population prefers to maintain the current commonwealth status, fearing loss of freedom and identity they perceive might accompany statehood. Puerto Rico (pronounced pwer-tuh ree-koh), the smallest of the Greater Antilles, consists of a main island of Puerto Rico and various smaller islands, including Vieques, Culebra, Mona, Desecheo, and Caja de Muertos. Of the latter five, only Culebra and Vieques are inhabited year-round. Mona is uninhabited through large parts of the year except for employees of the Puerto Rico Department of Natural Resources. 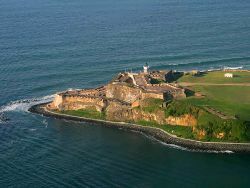 There are also many other even smaller islands including Monito and "La Isleta de San Juan" known as Old San Juan. The mainland measures some 100 miles by 35 miles (170 km by 60 km). It is mostly mountainous with large coastal areas in the north and south regions of the island. The main mountainous range is called "La Cordillera Central" (The Central Range). The highest elevation point of Puerto Rico, Cerro de Punta (4,390 feet; 1,338 m), is located in this range. Another important peak is El Yunque, located in the Sierra de Luquillo at the El Yunque National Forest, with a maximum elevation of 3,494 feet (1,065 m). 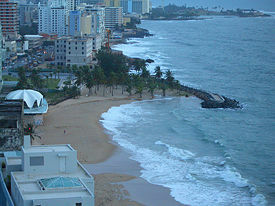 The capital, San Juan, is located on the main island's north coast. Puerto Rico has 17 lakes, all of which are man-made reservoirs. None of its more than 50 rivers are large enough for navigation, but those in the north are utilized for municipal water supplies, irrigation, and hydroelectricity. The southern coastal rivers are essential for agriculture. Located in the Caribbean, Puerto Rico has a tropical climate with little seasonal variation and enjoys an average temperature of 82.4 °F (28 °C) throughout the year. The temperature in the south is usually a few degrees higher than the north and temperatures in the central interior mountains are always cooler than the rest of the island, ranging from 73°F and 78°F (22°C and 25°C). Hurricanes develop between June 1 and November 30, occasionally traversing the island. Plant life is abundant and varied. 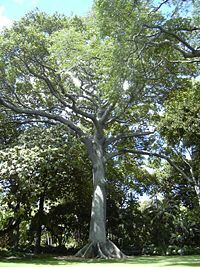 As of 1998, 239 plants had been recognized as endemic species. The south, drier, side of the island is covered in thorn and scrub vegetation while tropical rainforests dominate the north. Sixteen birds and 39 amphibians and reptiles have been discovered that are endemic to the archipelago. The majority of these are found on the main island. The most recognizable endemic species and a symbol of Puerto Rican pride is the Coquí, a small frog easily recognized by the sound from which it gets its name. The El Yunque National Forest, previously known as the Caribbean National Forest, a tropical rainforest, is home to the majority (13 of 16) of species of coquí. It is also home to more than 240 plants, 26 of which are endemic, and 50 bird species, including one of the top 10 endangered birds in the world, the Puerto Rican Amazon. The history of the island of Puerto Rico (Rich Port) before the arrival of Christopher Columbus is not well known. Early Spanish accounts as well as archaeological digs have helped us to piece together its history. 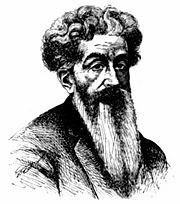 The first comprehensive book on the history of Puerto Rico was written by Fray Iñigo Abbad y Lasierra in 1786, 293 years after the first Spaniards arrived on the island. The first indigenous settlers of Puerto Rico were the Ortoiroid, an Archaic age culture. An archaeological dig in the island of Vieques in 1990 found the remains of what is believed to be an Arcaico (Archaic) man (named Puerto Ferro man) which was dated to around 2000 B.C.E. (4,000 years ago). Between 120 and 400 C.E., the Igneri, a tribe from the Orinoco region in South America, arrived on the island. Between the seventh and eleventh century the Taíno culture developed on the island and, by approximately 1000 C.E., the Taíno culture had become dominant, a trend that lasted until the Spanish arrived in 1493. The Taínos called the island Borikén or Borinquen, which means "the great land of the valiant and noble Lord" or "land of the great lords." The first European contact was made by Christopher Columbus during his second voyage to the Antilles, in 1493. Some say that Puerto Rico was not discovered by Columbus but by Martín Alonso Pinzón in 1492 when he separated from Columbus and went exploring on his own. The Pinzón family was given one year by the Spanish court to start a settlement in Puerto Rico, which would give them a claim to the island. However, they did not succeed. Originally named San Juan Bautista, in honor of Saint John the Baptist, the island ultimately took the name of Puerto Rico (Rich Port), while the name San Juan is now delegated to its capital and largest city. Spanish conquistador Juan Ponce de León became the island's first governor to take office, while Vicente Yáñez Pinzón was the first appointed governor, though he never arrived on the island. The island was soon colonized and briefly became an important stronghold and port for the Spanish empire in the Caribbean. However, colonial emphasis during the late seventeenth and eighteenth centuries focused on the more prosperous mainland territories, leaving the island impoverished of settlers. Concerned about threats from its European enemies, over the centuries various forts and walls were built to protect the port of San Juan. Fortresses such as La Fortaleza, El Castillo San Felipe del Morro and Fort San Cristóbal were built. The French, Dutch, and English made attempts to capture Puerto Rico, but failed to wrest long-term occupancy of the island. In 1809, while Napoleon occupied the majority of the Spanish peninsula, a populist assembly based in Cadiz recognized Puerto Rico as an overseas province of Spain with the right to send representatives to the Spanish court. The representative, Ramón Power y Giralt, died soon after arriving in Spain, and constitutional reforms were reversed when autocratic monarchy was restored. Nineteenth-century reforms augmented the population and economy, and expanded the local character of the island. After the rapid gains of independence by the South and Central American states in the first part of the century, Puerto Rico and Cuba became the sole New World remnants of the large Spanish empire. Toward the end of the nineteenth century, poverty and political estrangement with Spain led to a small but significant uprising in 1868 known as "El Grito de Lares" (the "Cry of Lares"). The Puerto Rican goal was to achieve personal freedom, the abolition of slavery, and full self-government. The uprising was easily and quickly crushed. Leaders of this independence movement included Ramón Emeterio Betances, considered the "father" of the Puerto Rican nation, and other political figures such as Segundo Ruiz Belvis. Later, another political stronghold was the autonomist movement originated by Roman Baldorioty de Castro and, toward the end of the century, by Luis Muñoz Rivera. In 1897, Muñoz Rivera and others persuaded the liberal Spanish government to agree to Charters of Autonomy for Cuba and Puerto Rico. The following year, Puerto Rico's first, but short-lived, autonomous government was organized. The charter maintained a governor appointed by Spain, who held the power to annul any legislative decision he disagreed with, and a partially elected parliamentary structure. In 1898, at the outbreak of the Spanish-American War, Puerto Rico, being a colony of Spain, was invaded by the United States with a landing at Guánica. Spain was forced to cede Puerto Rico, along with Cuba and the Philippines, to the United States under the Treaty of Paris (1898). The twentieth century began under governance of the United States with officials, including the governor, appointed by the president. In 1917, the Jones-Shafroth Act approved by the United States Congress granted U.S. citizenship to Puerto Ricans. Natural disasters and the Great Depression impoverished the island. Some political leaders demanded change; some, like Pedro Albizu Campos, would lead a nationalist (The Puerto Rican Nationalist Party) movement in favor of independence. He served many years in prison for seditious conspiracy to overthrow the U.S. Government in Puerto Rico. Luis Muñoz Marín initially favored independence, but saw a severe decline of the Puerto Rican economy, as well as growing violence and uprisings and opted to support the "commonwealth" option instead. The "commonwealth" was supported before Luis Muñoz Marín by other political leaders. Change in the nature of the internal governance of the island came about during the later years of the Roosevelt–Truman administrations, as a form of compromise spearheaded by Muñoz Marín and others, and which culminated with the appointment by President Truman in 1946 of the first Puerto Rican-born governor, Jesus T. Piñero. In 1947, the United States granted the right to democratically elect the governor of Puerto Rico. Luis Muñoz Marín became the first elected governor of Puerto Rico in the 1948 general elections, serving as such for 16 years, until 1964. Beginning during at this time, there was heavy migration from Puerto Rico to the Continental United States, particularly New York City, in search of better economic conditions. Puerto Rican migration to New York displayed an average yearly migration that is summarized as follows: 1930-1940, 1,800; 1946-1950, 31,000; 1951-1960, 45,000, 1953 (peak year), 75,000. In 1950, Puerto Rican nationalists Griselio Torresola and Oscar Collazo attempted to assassinate President Harry Truman. In response, Truman allowed for a genuinely democratic referendum in Puerto Rico to determine the status of its relationship to the United States. Puerto Rico adopted its own constitution in 1952, which adopted a commonwealth relationship with the U.S. During the 1950s, Puerto Rico experienced a rapid industrialization, with such projects as Operation Bootstrap, which aimed to industrialize Puerto Rico's economy from agriculture-based into manufacturing-based. Present-day Puerto Rico has become a major tourist destination and a leading pharmaceutical and manufacturing center. Still, Puerto Rico continues to struggle to define its political status. A number of plebiscites have been held in recent decades to decide whether Puerto Rico should request independence, enhanced commonwealth status, or statehood. Narrow victories by commonwealth supporters over statehood advocates have not yielded substantial changes in the relationship between the island and the U.S. However, the commonwealth option—which once had the support of well over 75 percent of the voting population—now has less than 50 percent support. This decrease has been met with an expanded support for statehood for the island, with both groups holding an equal share of support. The independence ideal, once the second-leading ideology on the island in the general elections, is now supported by about 3-6 percent of the voting population. The legal system is based on a mix of the Civil Law and the Common Law systems. Puerto Rico's formal Chief of State is the President of the United States; however, most of the executive functions are carried out by the elected Governor. The current constitution of Puerto Rico was approved through referendum in 1952 and ratified by the U.S. Congress, which maintains ultimate sovereignty over Puerto Rico. Under the 1952 constitution, Puerto Rico is a territorial commonwealth of the U.S. and is permitted a high degree of autonomy. Still, Puerto Rico does not have voting representation in the U.S. Congress; neither does it have any delegates to the U.S. Electoral College, and therefore Puerto Rican citizens have no representation in the U.S. presidential elections. A non-voting Resident Commissioner is elected by the residents of Puerto Rico to the U.S. Congress. Residents of the island do not pay federal income tax on income from island sources; however, island residents do pay social security taxes and other federal taxes. The island was also exempt from the national 55 mph speed limit that was mandated on the rest of the U.S. from 1974 to 1995. Puerto Rico's three major political parties are most distinguished by their position on the political status of Puerto Rico. The Popular Democratic Party (Spanish: Partido Popular Democrático de Puerto Rico, PPD) seeks to maintain or improve the current Commonwealth status, the New Progressive Party (Spanish: Partido Nuevo Progresista de Puerto Rico, PNP) seeks to fully incorporate Puerto Rico as a U.S. state, and the Puerto Rican Independence Party (Spanish: Partido Independentista Puertorriqueño, PIP) seeks national independence. Although Puerto Rico is, politically speaking, a Commonwealth of the United States, Puerto Ricans and people from other nations refer to Puerto Rico as a país, the Spanish word for country. This is a very common and accepted international status given to all dependent territories, also called dependent "states" by the UN. This is highlighted by the fact, for example, that Puerto Rico is an independent country in the sports world, even having their own Olympic teams. In the jargon of international law, an inhabited territory that is not a first-order administrative division, but rather forms an external, non-sovereign territory governed by a sovereign one, is both a "state" and a "country." But none of these cases—- neither U.S. "states" nor dependent "states/countries"—are considered sovereign international entities. As a commonwealth associated with the United States, Puerto Rico does not have any first-order administrative divisions as defined by the U.S. government, but there are 78 municipalities at the second level. (Mona Island is not a municipality, but part of the municipality of Mayagüez). Each municipality has a mayor and a municipal legislature elected for a four-year term. The first municipality (then termed a town) of Puerto Rico, San Juan, was founded in 1521. In the sixteenth century two more municipalities were established, Coamo (1570) and San Germán (1570). Three more municipalities were established in the seventeenth century. These were Arecibo (1614), Aguada (1692), and Ponce (1692). The eighteenth and nineteenth century saw an increase in settlement in Puerto Rico. There were 30 municipalities established in the eighteenth century and 34 more in the nineteenth century. Only six municipalities were founded in the twentieth century. The last municipality was Florida, founded in 1971. The municipalities are further subdivided into barrios, and those into sectors. The economic conditions in Puerto Rico have improved dramatically since the Great Depression due to external investment in capital-intensive industries such as petrochemicals, pharmaceuticals, and technology. Once the beneficiary of special tax treatment from the U.S. government, today local industries must compete with those in more economically depressed parts of the world where wages are not subject to U.S. minimum wage legislation. In recent years, some U.S. and foreign-owned factories have moved to lower wage countries in Latin America and Asia. Puerto Rico is subject to U.S. trade laws and restrictions. Puerto Ricans had a per capita GDP estimate of $17,700 for 2004, which demonstrates a growth over the $14,412 level measured in the 2002 Current Population Survey by the Puerto Rican Legal Defense and Education Fund. In that survey, Puerto Ricans have a 48.2 percent poverty rate. By comparison, the poorest state of the union, Mississippi, had a median level of $21,587, according to the U.S. Census Bureau’s Current Population Survey, 2002 to 2004 Annual Social and Economic Supplements. Puerto Rico has sometimes been said to have a white majority, an extinct Amerindian population, Africans, persons of mixed ancestry, and a small Asian minority. However, broad U.S. census categories have disallowed the mixed ancestry of most Puerto Ricans to be officially acknowledged. Most on the island tend to agree that what is "Puerto Rican" is generally a mixture between Spanish, Amerindian, and African genetic heritage. According to a recent study funded by the U.S. National Science Foundation, 61 percent of all Puerto Ricans have Amerindian mitochondrial DNA, 27 percent have African, and 12 percent Caucasian. Puerto Ricans living on the island are not counted among the Hispanics residing in the U.S.; in fact, they are not included in the U.S. population count at all, although all Puerto Ricans are U.S. citizens. Puerto Rico also is not included in the Current Population Surveys that the Census Bureau conducts to update its decennial census. During the 1800s, hundreds of Corsican, French, and Portuguese, along with a large numbers of immigrants from the Canary Islands and numerous Spanish loyalists from Spain's former colonies in South America, arrived in Puerto Rico. Other settlers have included Irish, Scottish, Germans, and many others who were granted land from Spain during the Cedula de Gracias of 1815, which allowed European Catholics to settle in the island with a certain amount of free land. Emigration has been a major part of Puerto Rico's recent history as well. Starting in the Post-World War II period, due to poverty, cheap air fare, and promotion by the island government, waves of Puerto Ricans moved to the mainland United States, particularly New York City. This continued even as Puerto Rico's economy improved and the birth rate declined. Emigration continues to this day. This, combined with Puerto Rico's greatly lowered birth rate, suggests that the island's population will age rapidly and start to decline sometime within the next couple of decades. According to the 2000 U.S. Census, 95 percent of the population consider themselves of Puerto Rican descent (regardless of race or skin color), making Puerto Rico one of the most culturally homogeneous societies in the world. Since its colonization, Puerto Rico has become the permanent home of over 100,000 legal residents of the Dominican Republic mostly, but there are also Cubans, Mexicans, and Colombians. The variety of surnames which exist in Puerto Rico suggests widespread immigration to the island from many regions. The official languages of the island are Spanish and English. Spanish is the primary language of Puerto Ricans, though English is taught as a second language in schools from elementary levels to high school. As of 2006, an estimated 3,860,120 people use Spanish as their primary language. A large majority of residents living in metropolitan areas are bilingual. In 1991, Governor Rafael Hernández Colón signed a law declaring Spanish as the sole official language of the island's government. While some applauded the governor's decision (mainly members of the political parties supporting commonwealth-status and independence), others opposed it, including statehood supporters. As a result of his actions, the People of Puerto Rico won the Prince of Asturias Award in 1991, which is awarded annually to those who defend and contribute to the growth of the Spanish language. Upon his election as governor in 1993, pro-statehood former Governor Pedro Rosselló overturned the law enacted by his predecessor and once again established both English and Spanish as official languages. This move by the pro-statehood governor was seen by many as another attempt to move the island closer to statehood, however, despite many attempts and plebiscites, it never came about during his two consecutive terms. The Roman Catholic Church has been historically the most dominant religion of the majority of Puerto Ricans, although the presence of various Protestant denominations has increased under American sovereignty. Protestantism was suppressed under the Spanish regime, but encouraged under American rule of the island. In 1984 the head of the Roman Catholic Church,Pope John Paul II , became the first Pope to visit Puerto Rico. Churches of many denominations can be found throughout the island. There is also a small Jewish community. Taíno religious practices have to a degree been rediscovered/reinvented by a handful of advocates. Various African religious practices have been present since the arrival of enslaved Africans. In particular, the Yoruba beliefs of Santeria and/or Ifa, and the Kongo derived Palo Mayombe (sometimes called an African belief system, but rather a way of Bantu lifestyle of Congo origin) find adherence among individuals who practice some form of African traditional religion. Puerto Rican culture is a mix of four cultures, Spanish, Taíno (Amerindians), African (from the slaves), and more recently, North American. This blend is evident in much of the island's dance, music, art, literature, and sports. From Africans, the Puerto Ricans have obtained the "bomba and plena," a type of music and dance including percussions and maracas. From the Amerindians (Taino's), Puerto Ricans have kept many names for their municipalities, foods, musical instruments like the güiro and maracas. Many words and other objects have originated from their localized language. From the Spanish they maintained the Spanish language, the Catholic religion and the vast majority of their cultural and moral values and traditions. From the United States they received the English language, the university system, and a variety of hybrid cultural forms that developed between the United States mainland and the island of Puerto Rico. The official symbols of Puerto Rico are the bird, Reinita mora (Spindalis portoricensis), the flower, Flor de Maga (Thespesia grandiflora), and the tree, Ceiba or Kapok (Ceiba pentandra). The unofficial favorite amphibian is the Coquí (Eleutherodactylus coqui). Another popular unofficial symbol of Puerto Rico is the "jíbaro," the "countryman." Education in Puerto Rico is divided into four levels. These are elementary, intermediate, high school and the university level. Students can attend either a public or a private school. Public schools are run by the state while private schools are run by private institutions, predominantly the Roman Catholic Church. The only public university system in Puerto Rico is the University of Puerto Rico. Puerto Rico currently has its own Olympic team and participates in the Summer Olympics and the Winter Olympics, as well as international representation in many other sporting events including the Pan-American Games, the Central American Games, and the Caribbean World Series. Boxing, baseball, and basketball are popular. They have their own professional baseball leagues, though San Juan hosted the Montreal Expos for several series in 2003-2004 before the team moved to Washington, DC, and became the Washington Nationals. In 2005 Major League Baseball announced that opening rounds of the newly formed World Baseball Classic, a 16-country tournament featuring top players, would be held in San Juan the next year. ↑ Nancy Morris, Puerto Rico: Culture, Politics, and Identity (Praeger/Greenwood, 1995, ISBN 0275952282), 62. ↑ 2010 Census Data 2010 Census Data. Retrieved October 30, 2017. ↑ Dependencies and Areas of Special Sovereignty. U.S. Department of State.. Retrieved October 30, 2017. ↑ Carta Autonómica de 1897 de Puerto Rico. Lexjuris.com. Retrieved October 30, 2017. ↑ Puerto Rico Commonwealth Population Totals Tables: 2010-2016 United States Census Bureau. Retrieved October 23, 2017. ↑ GDP, PPP (current international $). Retrieved October 30, 2017. ↑ "GDP per capita, PPP (current international $)", World Development Indicators database, World Bank. Retrieved October 30, 2017. ↑ World Bank World Development Indicators. World Bank. Retrieved October 30, 2017. ↑ The Global Competitiveness Report 2014–2015 (Puerto Rico). Retrieved October 30, 2017. ↑ Latino/a Education Network Service. de los barrios de las americas Retrieved October 30, 2017. BBC Country Profiles BBC.co.uk Retrieved October 23, 2017. Constitution of the Commonwealth of Puerto Rico - in English. topuertorico.org Retrieved October 23, 2017. The World Factbook - Puerto Rico. CIA.gov Retrieved October 23, 2017. Profile of General Demographics Characteristics : 2000. census.gov Retrieved October 23, 2017. General Assembly Resolutions 8th Session United Nations un.org Retrieved October 23, 2017. Puerto Rican Amazon Parrots international Retrieved October 23, 2017. Endemic species United Nations Environment Programme. Retrieved October 23, 2017. This page was last modified on 30 October 2017, at 22:27.